If you are going to be hand drawing your backyard design get a piece of graph paper. Draw your house and divide it up, listing the rooms. Now make some copies of this so you won't have to be redrawing the house every time. Draw as many different plans as you want in step 1 and 2 so you can see what different scenarios will look like. If hand drawing is not for you, there is landscape software available that will help you visualize your landscape better. If you have done the pre-planning part of answering the backyard design plan questions and have taken a measurement of your landscape project then you are ready to start your backyard landscape design. This is where you will define areas or outdoor rooms that you want or already have. Just make simple outlines circles or squares to define areas and then label them. For instant, kids area, entertainment, patio, private space, utility etc. 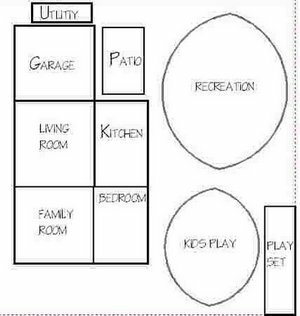 Draw different plans and compare till you get the one that fits your backyard the best. Here are the main spaces you should be planning now. Another thing to consider now is the type of grass you will have and if you will be sodding it or planting grass seed. Do make sure to draw to scale making the relationship on paper as they will be in your backyard. Take your time this should not be a fast process, think through all aspects of your landscape. The more time spent here will be less time in actually doing the landscape or having to go back and redo plans because you didn't think something through or you forgot something. Once you have finished the step 2 plan, you are ready to do your final design. Make the final design as accurate as you can with measurements and placements of trees, shrubs, structures, features, landscape beds, etc. Go back to your backyard design plan questions and make sure you have everything covered. Make notes to the side or label trees and shrubs if you have already decided on what you want. Even though this is called you final design you need to realize that some things will change when you actually start your landscaping. Set it aside and take a break, do something else and when you come back to it you will have fresh eyes and things will look different.